I’ve been really impressed with Toyota’s latest crop of cars but what on earth is going on with their truck division? This Tacoma is so disappointing is so many ways, and it is by far the freshest truck they offer. It starts with a lousy 6-speed transmission that makes this zero fun to drive. And why doesn’t this Limited grade offer height adjustable seats much less power? The driving position is very uncomfortable. Rear seat room is much tighter than in my 19 year old Tacoma. And then little things like not including the passenger side door for smart key entry, no CarPlay, the ancient looking switchgear, no automatic 4-wheel drive setting and heck for $43k you can’t even throw in some floor mats? 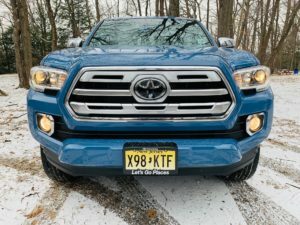 At least they’re consistent…This latest Tacoma immediately fits right in with the rest of Toyota’s dinosaur era truck lineup. Transmission mapping prioritizes fuel economy so you’re always stabbing at the gas pedal to induce a kick down to a lower gear. Lots of road noise makes its way into the cabin and if you’re taller than 6’1” you’ll be hitting your head getting in and out. I’d also like to see a 4-wheel drive auto setting for changing road conditions. New for the 2019 model year, Toyota gives you 2 more USB ports located in the center console. Not having a place to put my foot on the bumper while the tailgate is down still irritates me. For $300 though, Toyota will sell you a BedStep. 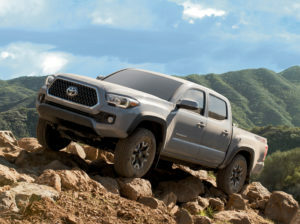 It’s anticipated that a refreshed Tacoma will debut for the 2020 model year at which point the competition will be coming fast and furiously.